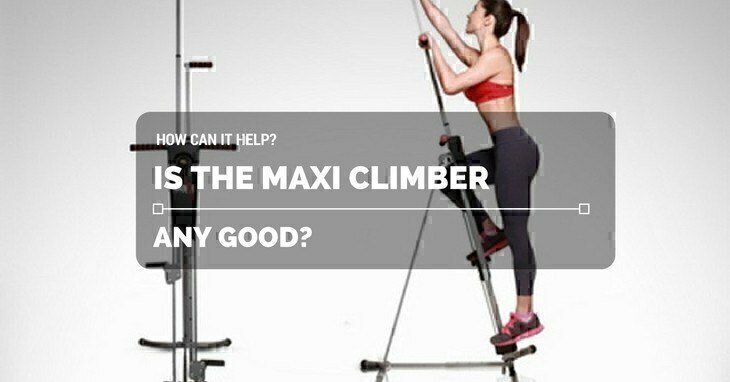 What Benefits Do You Get From Maxi Climber? →Is The Maxi Climber Any Good? How Can It Help? It has several advantages, and it’s not just good for your heart but your overall health. It improves memory, increases circulation which can give you a much healthier skin, boosts your mood and self-esteem, combats anxiety and stress, gives you lasting energy and helps promote sleep. It even protects you from certain diseases! To make it more efficient, try to exercise at least 30 minutes a day for seven days a week. Even though it works out your whole body, the strain is usually on your quads, calves, thighs, and legs because the muscles in those areas propel you to ‘climb’. While it shouldn’t be the ONLY physical preparation for mountain climbers, it’s still an excellent supplementary workout to whatever exercise you’re already doing. It’s all because of the total body engagement. In a nutshell, you use almost every muscle while performing this exercise. That makes it more useful in shedding off extra pounds as compared to using treadmills or stationary bikes. With the Maxi Climber, an hour of exercise can help you burn as much as 500 calories. Make sure you assembled the Maxi Climber correctly. Remember that you will step on it and use your whole body during the exercise. The first priority should always be your safety so you can avoid any possible injury which is quite common on exercise machines such as this. When I used to exercise on a treadmill, I often get ankle strains because the belt wasn’t lubricated properly and therefore I used most of my strength just trying to pulling it rather than running. Take note that it wasn’t an electric type. For the Maxi Climber, double check if you have tightened all the nuts and bolts correctly. And also regularly inspect the base if it’s stable and robust. Stay hydrated. Just because you want to work out for an hour doesn’t mean you can’t take breaks in between. Unless you’re fit and can withstand a continuous and rigorous exercise, you need to drink fluids in between and re-hydrate. Some people take sips of water while others prefer drinks that can replenish the water and electrolytes you lost without feeling heavy after drinking. Don’t overdo it. If you’ve lived a sedentary lifestyle and just starting to work out now, don’t immediately go all out and spend an hour doing an intense exercise. You see, the first time I ever went to the gym, I had a goal and I overdid it. So the next few days, I could barely move and every inch of my body hurt. The best way to do it is condition your body. Don’t be afraid to start slow – you can go for 15 minutes then gradually increase the duration and intensity. The important thing here is your consistency – that you will get on the Maxi Climber day with no excuses. Pair it with a healthy diet. Most health buffs will tell you that if you want to lose weight and stay fit, exercise is only 10%. The 90% will come from what you eat. So, while it won’t be totally useless, results will be slow if you’re still munching on junk foods and drinking soft drinks. The answer is plain and straightforward: YES as long as you do it right. Keep in mind that no exercise is truly efficient if you don’t do it correctly and supplement it with a balanced and healthy diet. The Maxi Climber has several advantages over other exercise machines, and it delivers results. Just follow these simple steps in staying safe during the workout and avoiding any injury such as unnecessary strain.